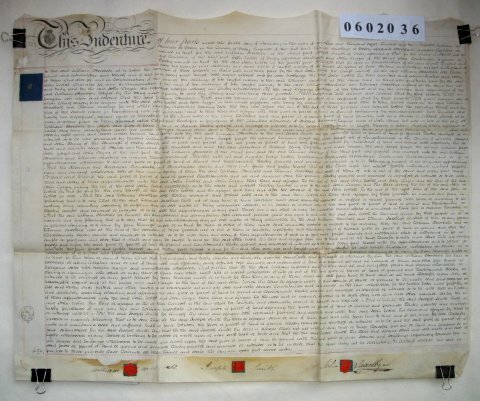 This is the second part of a contract of sale by Lease and Release in which William Mosedale is selling property in Derby to John Welch for £162/9/7d. It consists of a plot of 522 sq yds. bounded on two sides by Bag Lane and New Street (also known as Byng Street). We are told that William Mosedale aquired this plot in 1809, also by a contract of Lease and Release, in which Thomas Saxelby appears to be some sort of trustee acting in trust for William Mosedale. Similarly, John Curzon is acting in trust for John Welch and plays little real part. Joseph Smith is the owner of an adjoining piece of land and covenants to maintain a wall orfence between the two properties.